The global packaging and labelling services market in the healthcare domain has a high level of competition in terms of vendor landscape. The prominent players within the global packaging and labelling services market in the healthcare sector are DuPont, 3M, WestRock Company, and CCL Industries. A key strategy which is being adopted by leading players is to invest extensively in research and development in order to expand their product range as well as come up with innovations in pharmaceutical and medical packaging and labelling industry, states Transparency Market Research (TMR) in its latest report. 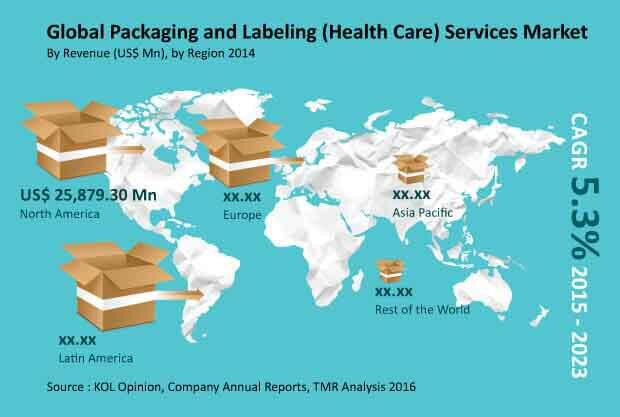 According to TMR, the global packaging and labelling services market in the healthcare domain will be worth US$136.27 bn by 2023. On the basis of packaging tape, the primary packaging activities is likely to dominate in the market. On the basis of geography, it is anticipated that Europe will prove to be lucrative market for packaging and labelling services. The rising number of Biotech and pharmaceutical companies in Europe is behind the growth in the region. By 2023, estimated to account for 31.3% of the total market. Asia Pacific is also expected to be a lucrative market with several growth opportunities. As per the lead author of this report, "the rising incidences of chronic ailments worldwide is boosting the growth of this market. Sedentary lifestyle is one of the key reasons behind the rise in chronic ailments." Rise in the health care spending will also support the growth of packaging and labelling (Health Care) Services Market. As pharmaceutical products and medical devices play a crucial role in ensuring public well-being, stringent policies and regulations are being implemented. This has forced that biopharma and pharmaceutical packaging companies to comply with the highest possible standards of quality. These strict regulations are expected to boost quality packaging and in turn will bode well for the global packaging and labelling services market in the healthcare domain. Good packaging leads to enhanced shelf life of pharmaceuticals, repressing the development of microbes. With growing interest in reducing the environmental impact, pharmaceutical companies are currently investigating bio-based as well as green options. They are doing so by investing extensively on research and development. On the other hand, complicated registration process is expected to hinder the growth of the packaging and labelling services market in the healthcare domain. The lengthy approval processes will also be a factor that will restrict the growth of the market. Nevertheless, the growing adoption of Nano enabled packaging within the pharmaceutical sector will drive the growth prospects of the global packaging and labelling services market. An increase in the demand from emerging nations will also be a growth opportunity for market players to tap on.